We are working together to improve our community and our wetlands. The Harney Basin Wetlands Initiative is attracting attention across the Intermountain West and beyond as a model for how collaborative approaches to conservation can generate consensus among diverse interests and leverage large long-term investments on both public and private lands. 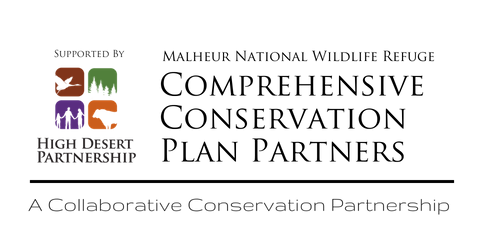 The collaborative planning process used to develop Malheur National Wildlife Refuge's comprehensive conservation plan laid the groundwork for this, and the relationships, communication and shared commitment to science and adaptive management that came out of that process have provided the foundations for the broader partnership. People talk a lot about landscape-scale conservation these days; the Harney Basin is one of the few places where the pieces are now in place to actually make it work. 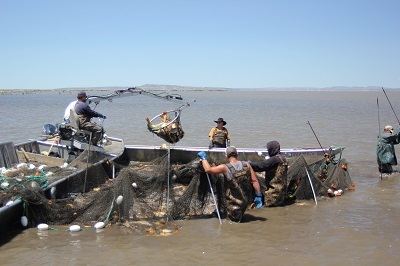 Carp have significantly altered the shallow lake ecosystem of Malheur Lake. Managing their populations will help improve foraging and habitat for waterbirds. 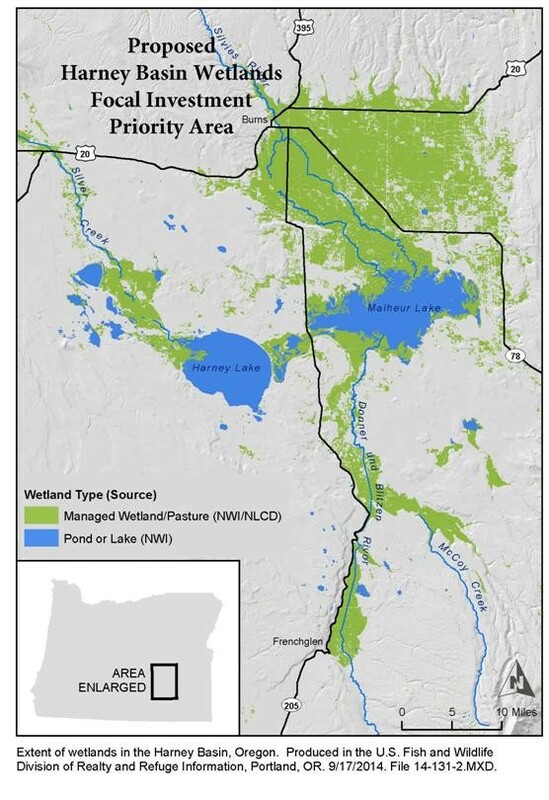 The Harney Basin Wetlands Initiative grew out of the collaborative process used to develop the Malheur National Wildlife Refuge's Comprehensive Conservation Plan. A group of local ranchers, agencies, and conservation groups came together to find solutions for the ecological challenges that face land management in the Harney Basin. This land and water has continental significance for migratory birds and is one of the foundations for traditional agricultural economies in Harney County. Harney Basin Wetlands Initiative partners have identified two major issues, carp and irrigation conversion, that are currently threatening migratory birds in the Pacific Flyway. These birds are dependent on the Harney Basin as a staging area. The condition of the birds that leave the flood irrigated emergent wetlands in the Harney Basin correlates with their breeding success in the north. In recent decades, the use of Malheur Lake by breeding birds has declined significantly due to carp overpopulation. Overpopulation of carp in the lake has changed the shallow lake ecosystem from a clear lake with abundant submerged aquatic vegetation and invertebrate fauna to a turbid lake with nearly no submergent vegetation. In addition, there is a growing threat to spring migratory bird habitat posed by the conversion of flood irrigation to sprinkler irrigation of the wet meadows in the Harney Basin. Conservation of the feeding and resting habitats in the Harney Basin is critical for the migratory water birds in the Pacific Flyway. 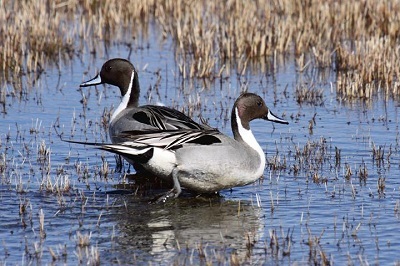 Pintail ducks are one of the migratory bird species reliant on the health of Harney Basin. Harney Basin Wetlands Initiative partners are focused on improving aquatic health and maintaining wet meadow habitats throughout the watersheds for Harney and Malheur Lakes and the streams and rivers that flow into them with a particular focus on MNWR and privately owned flood-irrigated meadows (see image below). There are approximately 513,000 acres of wetlands within the focus area of the HBWI. 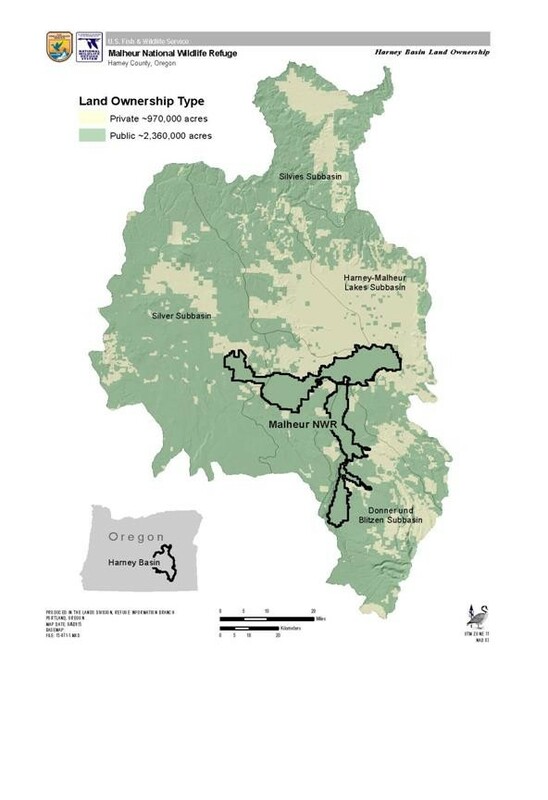 The Harney Basin Wetlands Initiative (HBWI) partners have focused on achieving healthy aquatic systems by adaptively managing invasive common carp, and maintaining and enhancing riparian and wet meadow habitats through conservation agreements and by addressing flood irrigation infrastructure. Click on the maps below to enlarge them. 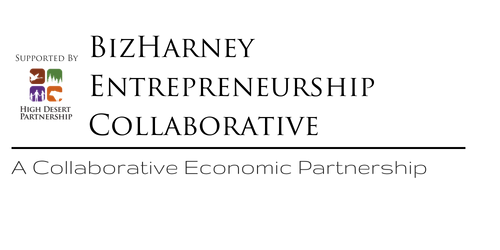 Focused Investment Priority area for Harney Basin Wetlands Initiative. Wetlands mapping from the National Wetlands Inventory (NWI). Land ownership in and around Malheur National Wildlife Refuge. 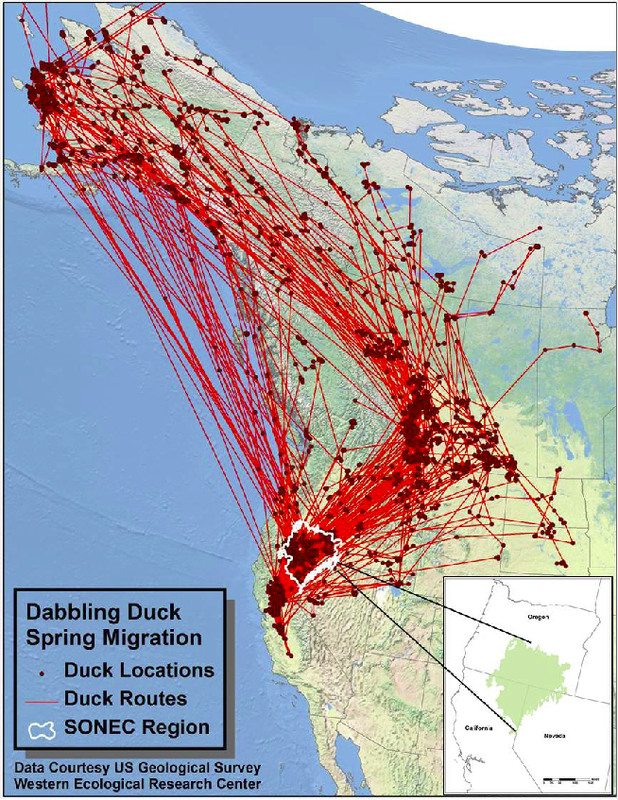 Spring migration routes by strategy category of adult female Northern Pintails PTT-tagged in the northern Central Valley of California during December-January and tracked annually through August each year 2000-2003 (Michael R. Miller, 2005). Harney Basin Wetlands Initiative has adopted the vision “to conserve and enhance the health of Malheur Lake by managing in harmony with ecological forces in collaboration with our neighbors, partners, and friends and to learn from our efforts, successes and failures and the surrounding flood irrigated wet meadows are managed using science based management practices that are common to public and private lands. There is a cooperative relationship between local ranching families and the MNWR staff working to build understanding of how to manage the flood irrigated wet meadows in a manner that reduces carp reintroduction, provides food for migrating water birds, and provides a sustainable economic return for ranching families." Do you think Harney Basin Wetlands Initiative is something you are interested in helping? Check out our How to Help page to see how you can contribute.